Help! I made a mistake! Is there a way to fix this? And then you will get to that moment that you have done your weaving, and you’ve maybe even added a crochet border, and you look at it, and you are like: “Oh noooo!!! Something has gone wrong!”. Well, in this video I show that all is not lost, and that you can easily fix weaving errors. All you have to do, is cut out the row where the error is, and needle weave in a new strand of yarn! When you have done a crochet border, like in the video, you just have to take care that you take the new thread through the border, through the crochet stitch, so that when you take out the original thread when finishing, the crochet stitch will still have it’s base, so it will not come loose. When you haven’t done a crochet border, you can just tie the ends of the new thread to the ends of the original thread, just like you did when changing colors. That’s all you have to do! 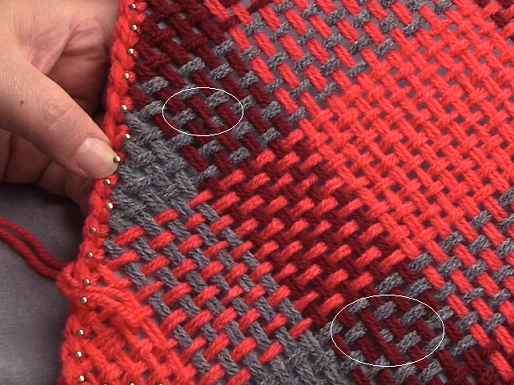 So, hope that this will be a help again in your weaving journey! Have fun watching!